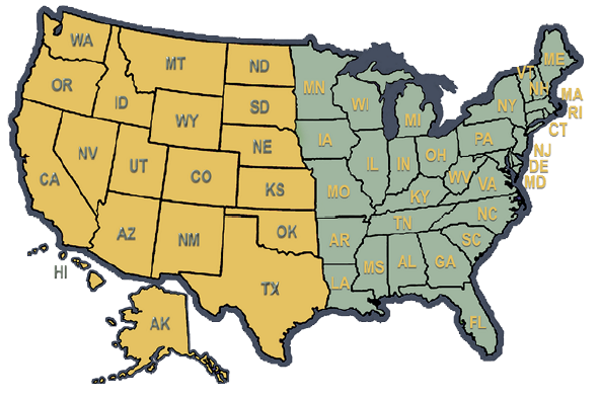 We have two Traffic Engineering Products shipping locations to help keep shipping costs to a minimum. Please reference the map below. Since 1965, Trigg Industries has been supplying Traffic Engineering Products for the traffic counting community. Our full line of traffic counting supplies is the industry standard and our east and west coast locations provide the quickest delivery times. Trigg Industries provides a one-stop supply for proven and road worthy products with support you can rely on. We provide rapid delivery from two stocking locations. We look forward to being of service. All bonafide government clients, open account net 30 days. Commercial clients net 30 days with approved credit. Visa, Mastercard, AMEX and Discover accepted. All merchandise, unless otherwise specified, is Newport News, Virginia or Los Angeles, California, shortest distance to you via UPS ground or specified carrier. Shipping is prepaid and added to invoice. Prices subject to change without notice. For quantities greater than those published online or in the catalog, please email, call or fax for quotation. Returned merchandise shipped COD, or merchandise returned without prior Returned Merchandise Authorization will not be accepted. All prices are in USD unless otherwise stated. UPS Worldwide Expedited, unless your own carrier is preferred. Orders are shipped 24 hours after receiving orders, except on holidays recognized in the USA or by UPS. Freight and cost of goods are pre-paid, in US funds. Customs and duty are your responsibility . All freight and cost of goods are pre-paid. Wire Transfer instructions are given at the time of order. Prices subject to change without notice. For quantities greater than those published online or in the catalog, please email, call or fax for quotation. Returned merchandise shipped COD, or merchandise returned without prior Returned Merchandise Authorization will not be accepted. We regret that we cannot accept credit cards on international shipments. Credit Card Authorization Form - Trigg Industries International, Inc.